Maintenance > Site Setup > DonorSnap Site Lookups. Customize the options (the “Lookups”) under the dropdowns that are installed with DonorSnap like Contact Type, Accounting Code, Campaign, Appeal, etc. 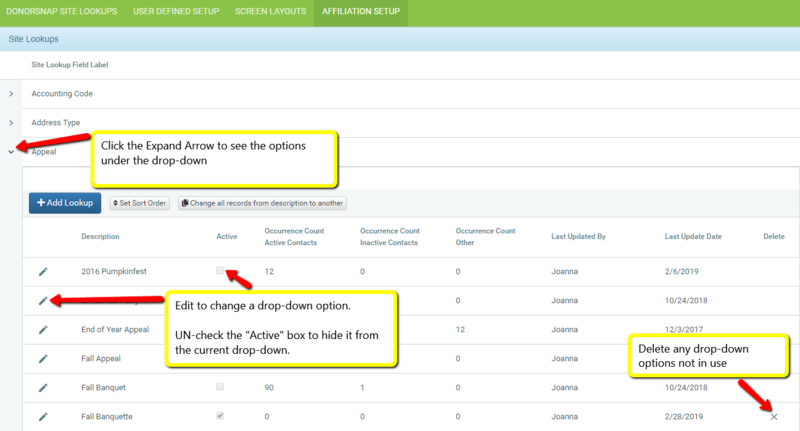 Add new lookups, delete unused options, Inactivate options that you’re no longer using. Change Sort Order. By default lookups will be listed in alpha-numeric order, however you can reorder them as needed. One of the simple ways to clean up your dropdown fields is to merge the options within a dropdown. Expand the row of the field you want to make changes to and then use the Change all records from one description to another button to merge them.